2017 is upon us, and this year seems light in comparison to last year’s stellar line-up of animated movies and direct-to-video products to must-see. DreamWorks Animation (one of my favourite studios) had three titles, but sadly with The Croods 2 dropped, the remainder does not seem as exciting. Time will tell, however, until official trailers for The Boss Baby and Captain Underpants are released. In the international front, Tad Jones: The Hero Returns might be fun, though this title ranks more in the honourable mention front. Also coming is Howard Lovecraft and the Underworld Kingdom. No official word has been made yet, but if Arcana Studios is sticking to schedule, we can expect this release in September. 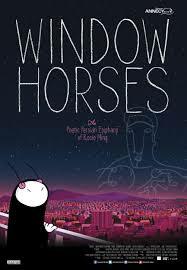 This colourful animation caught my attention when the National Film Board of Canada reported about its West Coast première at the Vancouver International Film Festival. If only it was playing the same or next day when I was in Vancouver, I could have gone to see it. Thankfully it will be getting a wider distribution in the new year. When considering it is about a young poet of mixed descent going to Iran to learn about her past, I feel she will discover that the world is interconnected in more ways than she realizes. The unique character designs is also another selling point, and I’ll be anxious to see where the plot goes.